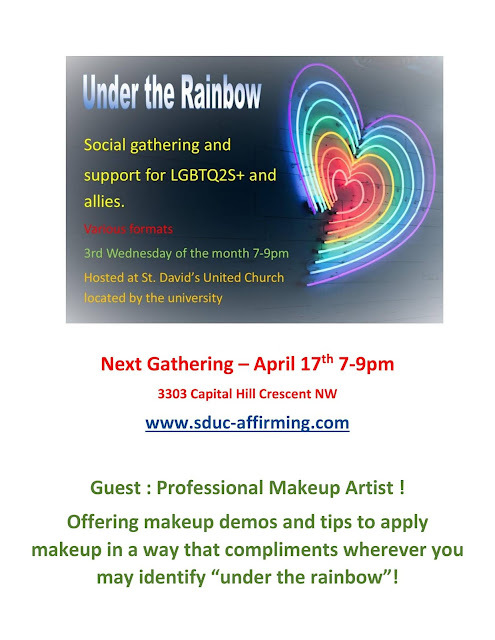 Offering makeup demos and tips to apply makeup in a way that compliments wherever you may identify "under the rainbow"
We had a great time at our PIE day celebration Sunday March 17. 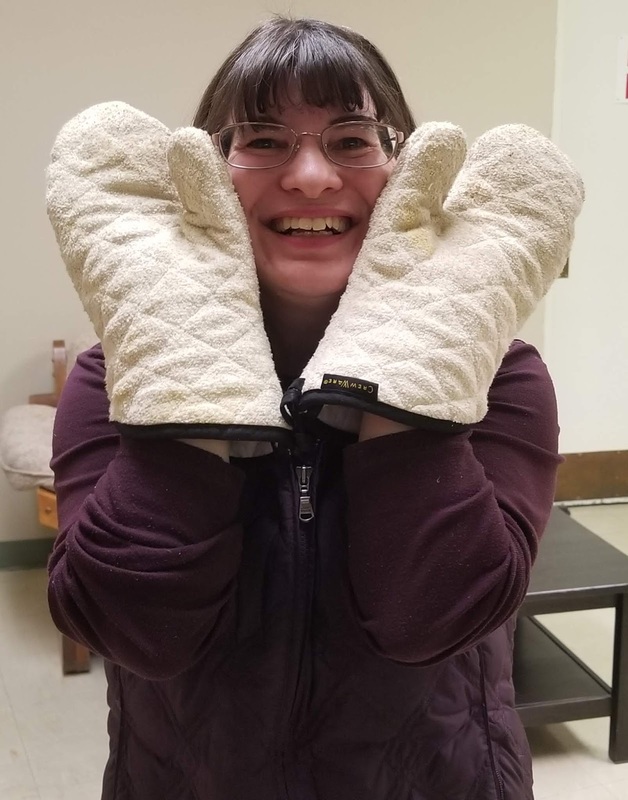 Our youth got into the spirit and made 7 apple pies and the Faith Quest Children made 8 quiches and 12 quiche tarts for our pie day! Upon arrival at the Church on Sunday, pies made by our congregation just kept coming in! A great mix of savory and sweet pies. 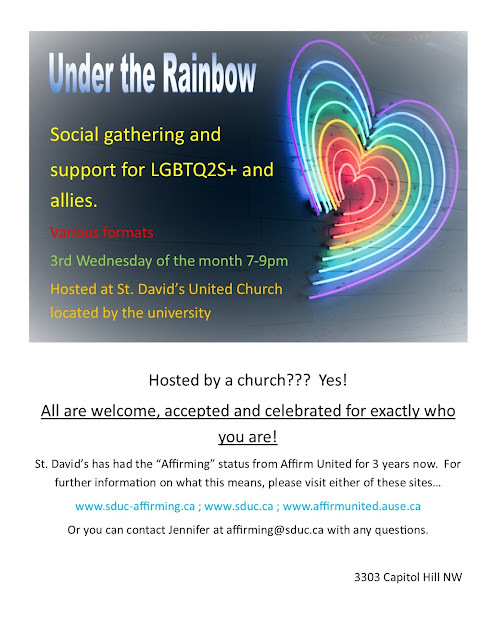 During part of the service we watched a section of the video that was created by Affirm United and Affirming Connections that explains what the acronym PIE is all about and then showcases how a few Churches across Canada are using Public, Intentional and Explicit ways to demonstrate the commitment towards the full inclusion of LGBTQ2SIA people in our faith communities. Then later in the service we welcomed our guest speaker Rocky from Rainbow Elders Calgary to give our congregation an overview of their organization. They can be found online at http://rainbowelderscalgary.ca/ They are going to be having a spring fling soon. Check out their website for details! 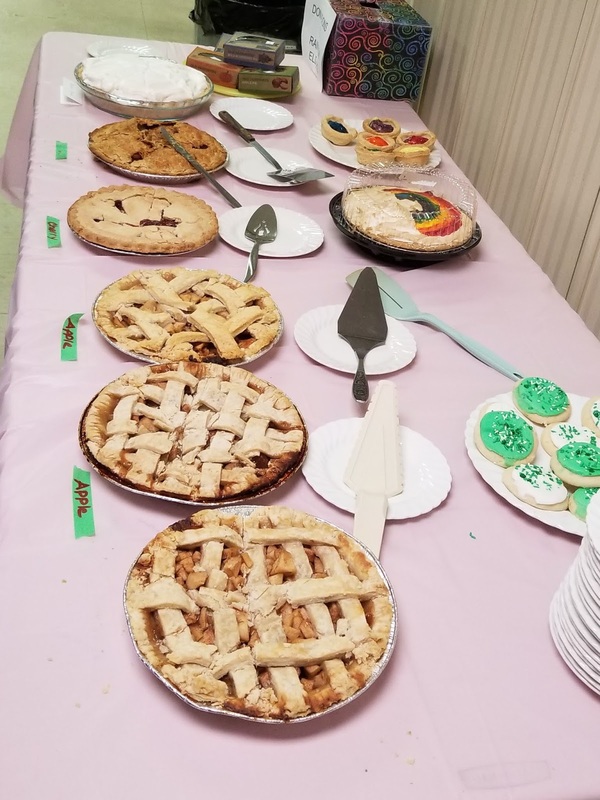 Following service, our congregation enjoyed eating all of the pies that were brought in. Well almost all of them...there were actually pies left over that were auctioned off. 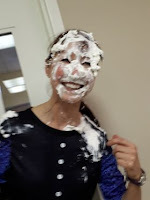 One of our members actually paid/donated $40 to get back the vary pie his wife brought in as it was his favorite! 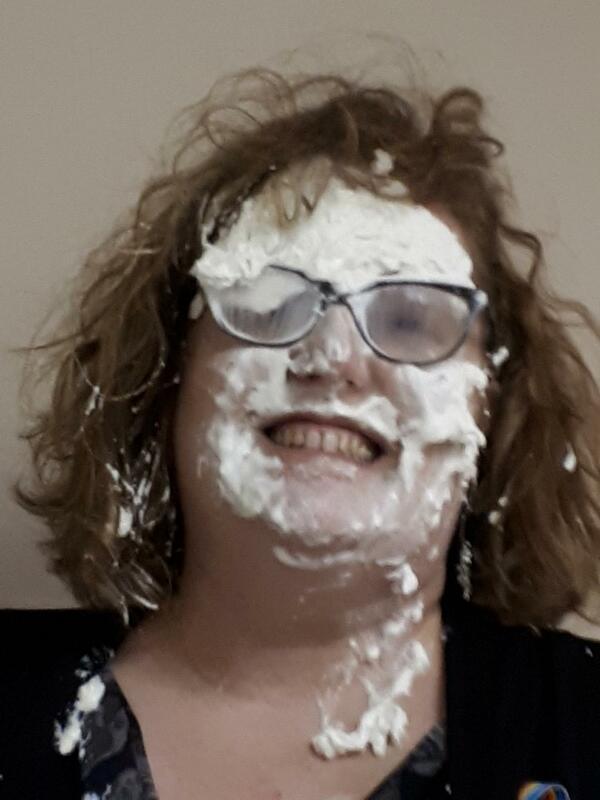 We closed out our event by accepting donations to have the opportunity to throw a whip cream pie at our fearless minister Peggy McDonagh. 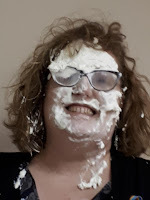 Of course, as Chair of the Affirming Committee, I also stepped up to have some pies thrown at me! THANK YOU for those that have already filled out the survey. For new visitors, please take a moment and click on the above tab labeled SURVEY to participate in a quick 6 question survey. 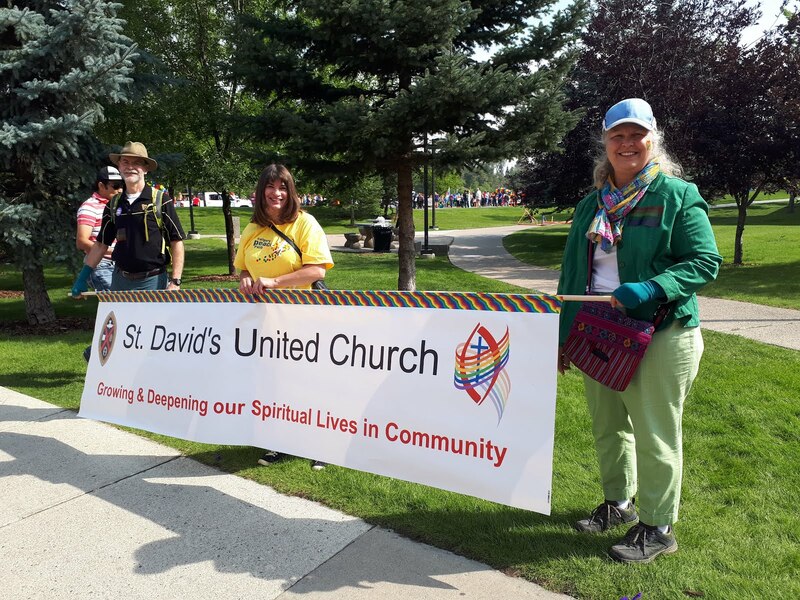 We have the opportunity at St. David's to start up a group of some sort and we are looking for the input from the community on which type of group/activity would be appreciated. The survey will be available for input until the end of November. The first post! I will be learning along the way. So this blog will probably look different many times over the next while.